If you are a member of Worldcon 75, then I ask you for your vote. You can do this by mailing in a ballot (please note July 29 receipt deadline for US mail) or in person at the Helsinki Worldcon. Please vote for Dublin 2019. It is so important to us and we need and want your support. We have worked very hard over some six years now to get the bid to where we are, and incredibly we are unopposed. But your vote is still important to us and we need and want your support. Funds from the Advance Supporting Membership you purchase when you vote will provide important start-up funding to the convention. Also, if you are one of our over 1200 pre-supporters, your vote will also help you convert to an attending member of the convention (see below for more about that). It is unusual to be unopposed, given that in recent times up to four cities have bid in prior Site Selections. 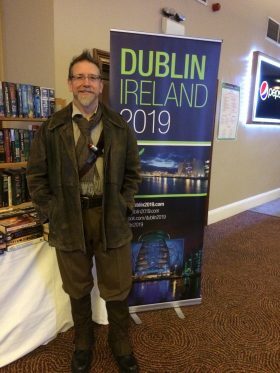 The Worldcon is really in demand, and we are proud to say that we feel we did a decent job of promoting Ireland and Dublin and the idea of a World Science fiction convention in Dublin. Voting is an unusual element when it comes to conventions. Obviously we all vote with our hearts, minds, pockets and feet when we go to cons and have a great time. To host a World Science Fiction convention, there is a lengthy process that really begins with Site Selection. But you know what. Getting the largest gathering of science fiction, fantasy and fantastic fiction fans in one venue for a colossal weekend of books, comics, film, TV and so much more is an incredible aspiration. Now in its seventy-fifth year, the Worldcon is a celebration of things that we love, and welcoming people from dozens of countries to Ireland will be an amazing opportunity. It is beyond belief how much work and effort goes into it, but we have hundreds of people – from Shanghai to San Francisco, from Galway to Wexford, from Belfast to Cork – all keen to see it happen and working to make it so. Our commitment is measured in those who believe in us, and right now we have over 1,300 bid supporters who have paid us their hard-earned cash to support us winning the right to hold the 2019 Worldcon in Dublin. It is amazing, and we are so grateful for you and your part in making this happen. 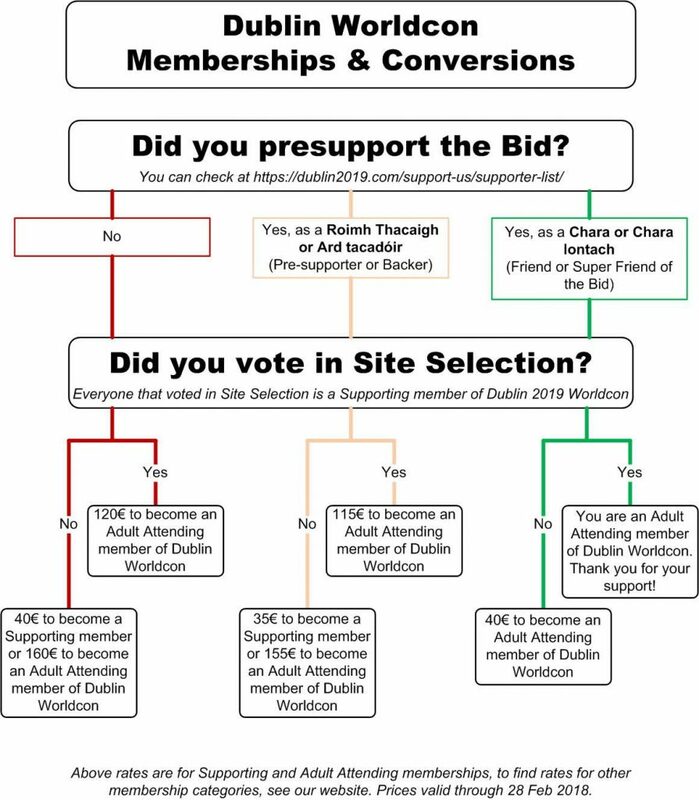 If you are a Friend, Young Friend or Super Friend of the Dublin Bid and then vote in Site Selection, you will automatically become a Full Attending member of the Dublin Worldcon, if we win. The more, the better – if we have hundreds of Full Attending members at the end of Site Selection, it puts us in a strong position. The more secure we are and the more who join, the sooner we can plan and budget for the extras and make it a phenomenal five days in 2019. We would like you to be a member of our Worldcon at the start. We have worked long and hard to ensure that Dublin 2019 is a viable convention, but we need to get thousands of people to support us by joining and coming along, and we want to start that strongly and continue strongly. Now through 11:00 GMT on 11 August, you can upgrade to Friend, Young Friend or Super Friend by emailing registrar@dublin2019.com. Young Friends must be born between 15 August 2006 and 14 August 1994 inclusive. Cara Og Young Friend €60 + Vote €40 = Youth Membership. So please become a friend and please vote. If you are going to Helsinki Worldcon 75 there will be a desk in exhibits that will be open until 4 p.m. EEST on Friday 11th August where you will be able to vote. Hand carried votes are welcomed, with the appropriate funds. You can also mail in a ballot by paying for an electronic coupon. And US fans can mail their ballot with a US cheque to an address in Minnesota. The deadline is a week away for that, (29th July) so you can choose whether to use a Disney Villain or Eclipse stamps to send your ballot and cheque in, if you are in the US. Details about site selection and how to vote are available at www.worldcon.fi/wsfs/site-selection/. For Irish fans not attending Worldcon 75, ballot collection parties and social meetups will be held on the 29th of July at the Franciscan Well Brew Pub, 14B North Mall, Cork, and then on the 5th of August, we will have a meet up in Dublin. More details on these are on our Facebook page. Voting helps us, if we win, we will get those voting funds and we’d welcome that, working to bring you the first ever Irish Worldcon. Now there’s a thing worth voting for.